Today is an exciting day at Santa Anita. 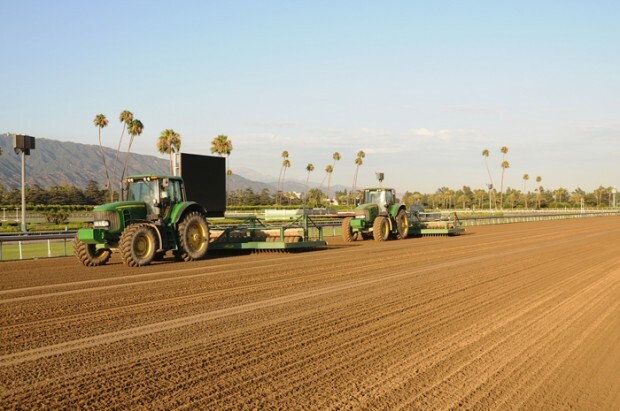 It is the first day horses will be permittedto use the ‘new dirt main track’ since the renovation has been completed. They will be able to go on the main track to jog and gallop this morning for the first time. Such terrific news! As many of you may have read, the dirt surface on the SA main track has been completely redone. A great deal of planning, organization, and scientific study goes into this process. The man behind the scenes responsible for orchestrating this project is Ted Malloy. John and Dottie go over to Santa Anita at night to check on the horses John has stabled there. While doing so, they take SOPHIE for a little walk and go out and check the surface. My John has visited with Mr. Malloy countless times as this renovation has been taking place…even to riding around in the golf cart with him to inspect certain sections of the track. To explain the track renovation process “very simply”, all of the work needs to be accomplished in stages. It starts with detailed research concerning the types of materials needed…and then purchasing them. Once all of the ingredients are on-site, the crew can start work on the actual ‘track’. The old surface needs to be removed. The track is taken down to the ‘base’ and inspected along with the drainage systems etc. The next step involves mixing the materials together to create the ‘cushion’. This ‘cushion’ is then put on the base of the track. It is approximately 6 inches of material. Part of this is a bit more compressed and becomes the PAD for the track. The remaining portion which is about 3 1/2 inches deep is the more ‘fluffy’ part of the surface. This is what you actually see when you are looking at the track. Normal scheduled maintenance is required using harrowing and water to keep the 3 1/2 inch ‘fluffy’ part of the cushion ‘consistent’….all the way around the entire oval. Needless to say, CONSISTENCY is extremely important! This is so significant for the horses, of course, but also for those who enjoy handicapping our sport! Almost finished! Photo taken last night by MY JOHN! 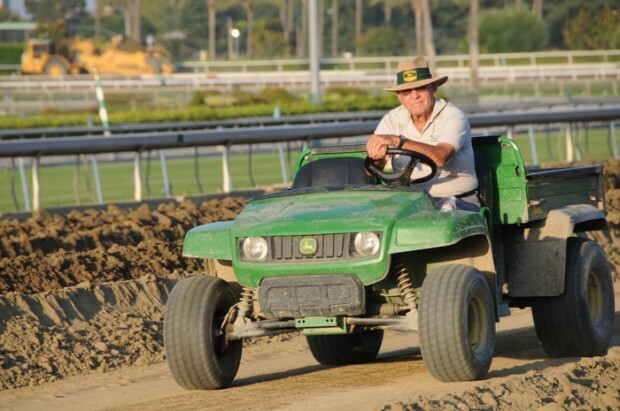 Thank you so much, MR. MALLOY, for adding your great knowledge and experience to our Santa Anita dirt track! Great photo of Shackelford. He’s a spirited boy. Think we’ll be hearing a lot from “Miss Tricky”. Hugs, J.B.
Glad you enjoyed the line. Abigail and Ann Maree posted two more links of Frankel on Diary #306. You can see the race from different camera angles. You’re so right, Laugh-In was ground breaking. Hugs, J.B.
Oops! Meant to say “link”. Hugs, J.B.
You’re welcome. Check out two more video links of the race posted by Abigail and Ann Maree on Diary #306. Hugs, J.B. I loved the picture foe #304. I call it Three Beautiful Ladies Reading. I hope all are having a very fine day. Thank you for sharing the science of rebuilding a race track. I’m glad Dottie and Your John are keeping an eye on that progress. I certainly hope this means that the track will be safer and there will be many fewer accidents. @ Kari Bussel: I love your new video and saved it to favorites since I know I will want to see it again and again. It is excellent as usu! @ Karen Gogue: Thank you for all you do and being so encouraging. @Barbara Wood: Thank you for sharing the link to Dyna King/Gifted ‘s story. I know this happens again and again. I will never understand it in my heart. Many thanks to Judy Glore and Greg Ambrose for telling the story. @DJ: You have spoiled me. I look forward to the morning and evening prayers, so beautifully stated. Thanks for the authors of some of those so I could find out more. Some are born encouragers and I think you must be one of those. @Cheryl Smith and Amanda Gilliland: Belated birthday wishes! Hope you will have a great new year. @ Susan in TN: Thank you for the passion in your rescue work and for sharing your stories with all of us. I look forward to your progress reports. I’ve fallen in love with your charges and especially Chester. I will try to make a donation soon. I’m just hoping I will have income after August 3rd. @Diana S and Georgia Harper: So sad for First Dude and Awesome Maria and RIP Be Driven. Also sympathy for the others involved in the incident at Del Mar. @Abigail in Montreal: I thought I’d seen all available videos on Secretariat. The last video was new to me and so moving. Thanks for sharing it. @Sue Frederick: You gave me a case of LOL at reading your story about Z reading Her John’s racing form. I used to say that Macho, my Siamese kitty should have received an Ed. S. too since he sat on my shoulder as I read and “helped” my type the final paper. @Sharon Call: Love your direct thinking, i.e. Save the one who’s here…Why it would not be good for Z to have a “ka-zillion” visitors…Why we should all feel so blessed that Z, our treasure, is retired and strong and healthy, instead of still racing at considerable possibilities of being hurt. @JAG: missed you and glad to see you back. I have enjoyed your comments, encouragements, links and other information. Thanks for sharing “Living Legends”! @Judy Berube: enjoyed pictures of Saratoga and laughed at It’s Tricky’s reaction to ice water. (Glad nobody was hurt.) I look forward to your daily comments…So much to learn from you. I don’t think I you thanked for the sites for Phar Lap and Citation. Thanks for the link to Cloud. I didn’t understand whether he was hurt in the tragedy that happened to two of his herd. @Shari Voltz: Enjoyed your recounting of the visit to Our Mims. I hope I will be able to make a contribution soon. @Kathryn Cogswell: Thanks for posting the information about the USPO closings. So far, so good. Our little tiny part-time PO doesn’t seem to be on the list. @Ann Maree: I voted. Thanks for sharing the information so that I would know to do so. @Margaret and Sherry Drish: Death by careless drivers is preventable. So sorry with you. @Trina: Thank you for sharing the Owny story. @ Terry Crow: I look for your jokes and humor. Even when you know…Your presence is missed in your absence. @all: I love being a Dumpling! I bet the next diary posting is up. So, thanks to everyone for more good reading! Please forgive several typos. I have had internet connection problems since there are storms all around and had to retype several times. I finally typed on a word document and saved and copied, as suggested by one of you terrific Dumplings. I thought I had cleared all the errors, but I was wrong. To DMCQ: Thank ‘you’ for the encouragement! United with you in the Spirit of prayer..
Trina: Bought two sheets of stamps. They hadn`t opened them yet. Thank you for your kind words; enjoy your posts as well. Glad you enjoyed all the links. The link with that fabulous photo of It’s Tricky reacting to the ice water was originally posted by Max. Don’t know how Barbara Livingston does it. She gets the best shots. As for Cloud; in her post Margaret said she did not think he was hurt by the negligent driver. Hopefully he’s OK. Hugs, J.B. MANY HORSE BARNS DO HAVE SPRINKLERS. Many horse barns also habve lightning rods to protect against lightning strikes. The question as to why that barn had neither should be posed to Mr. Clay. I am sure Three Chimneys could afford both for every barn. They take in huge sums every year with stud fees and boarding. Sprinklers or lightning rods would have saved that barn. I read about a barn fire in a large Standardbred barn that had sprinklers and not a single horse was lost. Overbrook’s Storm Cat has sprinklers and air conditioning in his barn. There are many racetrack barns with sprinklers.The reason some barns lack sprinklers is that some people care much less for their horses than their wallets. Insurance may be cheaper than sprinklers and will pay to replace barns and horses. Sprinklers and lightning rods should be mandatory and insurance companies could make it cheaper to install sprinklers and lightning rods by adjusting premiums for barns without them way way up. Hugs back to you Judy. You’re so right. Unfortunately, some owners just don’t care enough about their horses. It would be the right thing to do to make sprinklers and lightening rods mandatory in horse barns. Hugs, J.B.
@EK: Thanks for comment about the availability of sprinklers and lightning rods. I’m hoping that people will see and safety-up for their horses. Thank you for explaining how a track is properly set up. I think I need Mr. Malloy to help me with my riding arena. Interesting, as always, Zenny! Bless you and your little one. “She went down to the South, where she knew everybody but the Ghost of General Lee . ..” [said by Director Robert Mulligan of Ellis ‘Boaty’ Boatwright, who discovered ‘To Kill A Mockingbird’ children — not actors — Mary Badham (Scout) & Phillip Alford (Jem)]. Kc: Downsouth on the River Wadi here…with Dema and praers. A dry day,to say the least. Will you find? You are correct, I will toast through ..a greater love given to Thou, than for my selfish heart. Those darn candles! He was accepted in today. Score: God 1, DJ 0, Thank His Goodness God always Wins! Now those darn candles — I`m writing a note to send it up in smoke, while Zenny rainbows arc through. K.
through tears…thank you. God always gets the best. Thank His Goodness, I suppose. DJ: Concerned .. . cartouche.khc@gmail.com [When you`re watching Atticus making sense of a bad deal [“We had a good chance; we had such a good chance.”] (after the loss of Tom Robinson), anything else is a snare & a delusion. K.
To Kc: Smoke and mirrors…Ta! Zenyatta, it seems that you are familiar with some of the horses that John is putting into Santa Anita. 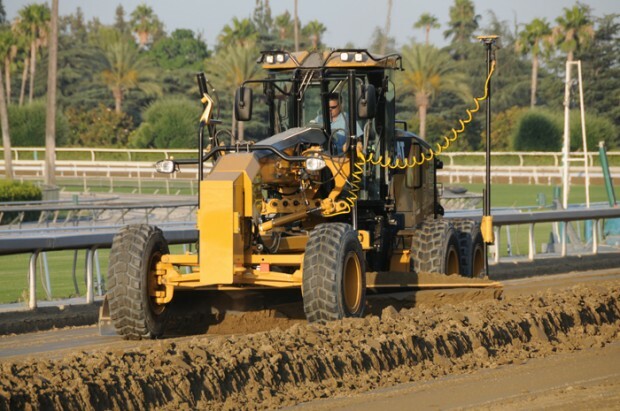 It is good that they are redoing the track out there to make it better and safer for the horses.